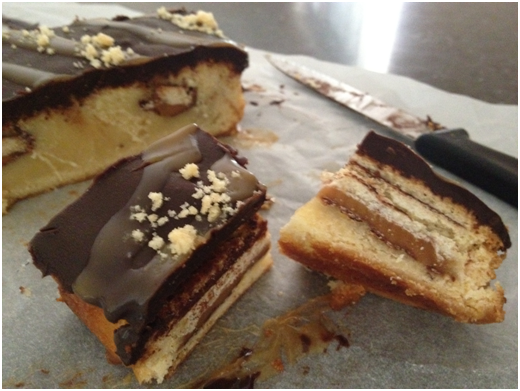 Well, she is back again and with lots of tips and a delicious recipe! Everyone loves receiving baked goods. It is human nature. But how should the gift giver wrap them? In a jar, in a box, in some flimsy clingwrap? Marcela’s tips and ideas are the only way to go about giving out baked goods for sure! Enjoy! What is a more personal statement of gratitude and thanks when giving a gift to someone than homemade baked goods? Cookies are a classic, all-time favorite. Whether it be a sugar cookie, peanut butter or chocolate chip, friends and family alike will be delighted with this gift. Plastic see-through bags with a personalised ribbon would be a simple and cute gift wrap. Made a batch of all sorts of cookies? There are readymade cookie packages available as well that can divide your cookie selections. Clear or colorful take-out style boxes are haute and make for a perfect baby shower or birthday present. Need to help raise money for a certain cause? Nicely wrapped homebaked goods can be just the thing to add extra oomph and posh to your baked goods sales. Have fun being creative with shaping your baked goods. For example, for Fourth of July, make star-shaped treats. You can also find cookie cutters shaped like surfboards, beach balls and various sea creatures (starfish, crabs, seahorses, etc). Want to make the chocolate chip cookie into a sweeter, surprising treat? Surprise them with surprising bite into an Oreo Stuffed Chocolate Chip Cookie! Makes: This recipe makes about 2 dozen very large cookies. Mix well the butter and sugars, then add the eggs and vanilla. Combine well. In a separate bowl, mix the flour, salt and baking soda. Add in the wet ingredients and the chocolate chips – mix well. Using a cookie scoop, take one scoop of cookie dough and place on top of an Oreo cookie. Take another scoop and place on the bottom of the Oreo Cookie. Using your hands, seal the edges together by pressing and cupping. Place the cookies on a parchment of silpat lined baking sheet. Bake for 9-13 minutes or until the edges are golden brown. Cool for 5 to 10 minutes. Is the person receiving your gift a coffee fan? If so, biscotti would make the perfect, European-inspired treat to go along with his/her coffee or tea or hot cocoa! You can use the typical candy store supplies to wrap this traditional treat or a small gift box with a clear window. Bread is practical, easy and fun to make, and the person you’re giving this gift too will think about you during breakfast and lunch when they devour your present! Purchase cute bread loaf pans in fun designs to add your personal style and touch to your gift. Bread pans are available in a wide variety of styles and sizes, varying from individual bite-sized shapes, to bundts, to one-pound loaf pans. Crackers or pretzels are guilt free treats for those with more of a salty tooth than a sweet one. They are also easy to make and package. For a more indulgent treat, use a pretzel mold and add flavored chocolate. Decorated pretzel sticks make great party favors! If your loved one is a fan of chewy treats, brownies or fudge wrapped with tissue paper and tied with an adorable bow would make for the perfect gift as well. You can even get more creative by using yummy licorice strings as ties. Purchase a gorgeous dolly and wrap in a clear plastic to serve and present your gift. It would make as a wonderful centerpiece to anyone’s kitchen or table. You can also try a sectional box to make your homemade gift look like it came straight out of a cupcake shop. Another creative way to showcase your cupcakes to be the center of attention – turn them into an eye catching cupcake bouquet! All you need are plastic cupcake holders, toothpicks, a Styrofoam ball and a decorative bucket or pot to hold your bouquet in. Place half or the entire Styrofoam ball into the bucket or pot, and then place the toothpicks all around the ball. Stick the plastic cupcake holders through the toothpicks through the center, and place your cupcakes through the toothpicks in the cupcake holder. Now, you have a delightful present that you may actually have difficulty parting with to give away! 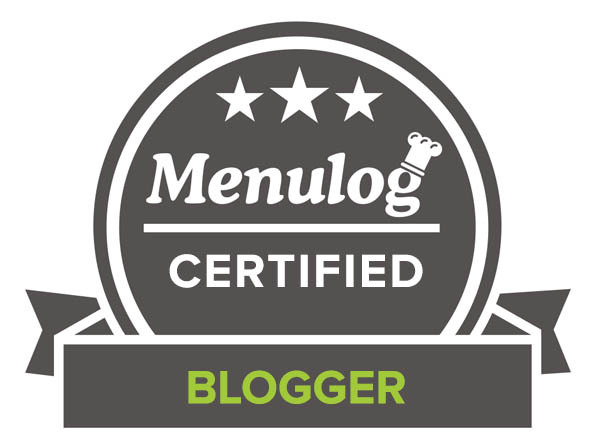 Marcela De Vivo is a freelance writer from California whose writing covers a range of topics, including health, marketing, tech and gaming. She loves sharing DIY tips for cooking and home improvement. Find more tips by following her on Facebook and Twitter! 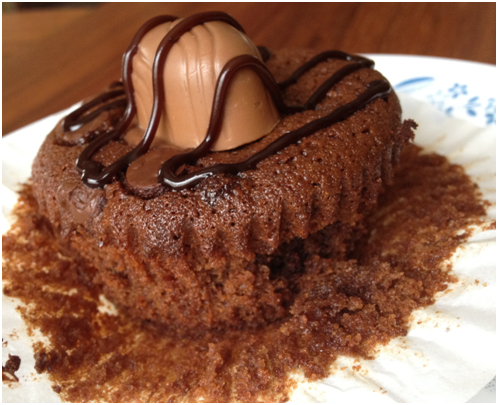 I like to eat cupcake and cookies and it is nice idea to gift someone online with using online gift sending service. It is good because sometime we can’t meet personally and this thing help us to send gift on special occassion. I love all of these ideas, CCU. We could take turns and send you one package every week while you’re at college. After all, proper nutrition is so-o important. Who won’t love these delicious treats as a gift? Simply awesome! Chocolate Chip cookies and Oreos! I love it! Great post! I love giving out my baked goodies but often struggle with coming up with creative ways to package them. Very useful, thanks! A stuffed chocolate sandwich cookie…stuffed inside another cookie? My mind is blown 🙂 These sound like very tasty sweet treats! I love giving baked goods as gifts! Especially sweet and indulgent ones. Great guest post! PS – Congrats on graduation, CCU! Who wouldn’t feel very special indeed being on the receiving end of any of these gorgeous goodies! And CCU, I am so excited for you :-)! you are so doggone fabulous with all of your DEEeelish sinful presentations. LOoooooooooooove the stuffed Oreo Cookies. Love the oreo stuffed cookies! !My kids would surely want a million of those 🙂 You will be graduating! !How exciting!!! Those oreo stuffed cookies sound amazing! Great tips. Some of these treats are too decadent. Love ALL of these goodies! My head is spinning with all the wonderful sweetness!! I sure would love to GET some of these as gifts! Everything looks so delicious! So close, you’re almost there, deep breath now. I wouldn´t mind receiving these stuffed cookies as a gift Uru! I am about to be giving away some cookies soon so it was nice get some ideas on how to package them. Great guest post! This is a treasure trove of goodies! I love each and every recipe! The brownie recipe is calling my name right now. 🙂 Keep studying, CCU. The end is in sight! And thank you, Marcela! Receiving home made goodies is the best! I would be so happy to receive any of those delicious treats as a gift. Giving homemade baked goodies is the best gift. I am a coffee fan and I love biscotti. Thank you Uru and THANK YOU Marcela De Vivo for these wonderful recipes and presentation! Food as gifts is always so great!!! I wish someone would send me all of these delicious foods as gifts! Especially those oreo-stuffed cookies – I’ve been wanting to make them for the longest time. We (meaning my wife) bake a lot, and if we ate everything we’d be enormous! So we give away most of what we bake. People do appreciate it, and we appreciate not having to eat all of it. 😉 Really nice post – thanks so much. 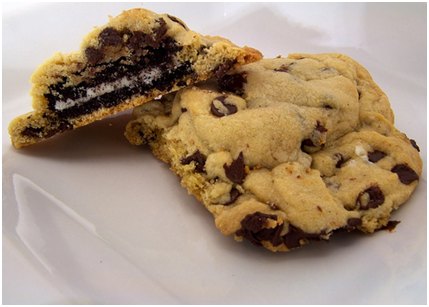 The Oreo stuffed chocolate chip cookie is genius! 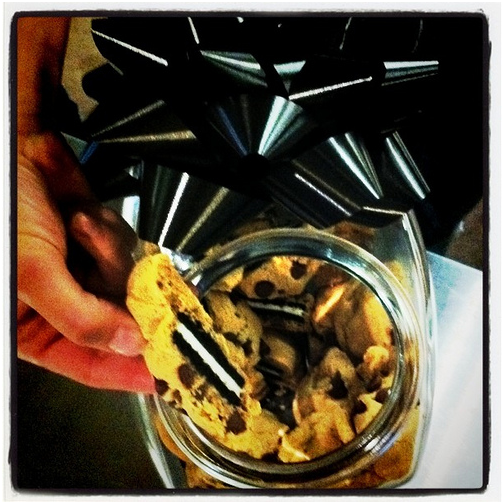 Oreros inside a cookie – this is an awesome idea! Giving baked goods is something I enjoy doing fairly often, but this post was a great reminder to dress ’em up a little bit! Fun ideas and great recipe links, too. Thanks! I love those oreo stuffed cookies!